Under the theme “A Journey with Music of the World,” the new show features a melting pot of worldwide cultural performances intertwined with Korean flair. “In honor of this milestone (the 30th anniversary) we knew we needed to tackle something new and bigger for our stage. So we tried to broaden our vision when coming up with this storyline,” said SPAC director Choi Jong-sil during a press conference at the Arko Arts Theater’s Grand Theater on Wednesday. The dance and music production follows the storyline of four members of the SPAC -- In-gu, Yeong-sin, Sang-hyeon and Yeong-du -- who train together for years in the hopes of one day being able to premiere a new production that best represents the modern Korean arts scene. The men receive an once-in-a-lifetime opportunity to travel the world and visit five countries to learn about their culture, music and dance. The performers visit Bali, Madrid, Burkina Faso in West Africa, Trinidad and Tobago and New York City. They find out about new musical instruments, rhythms and dance techniques. 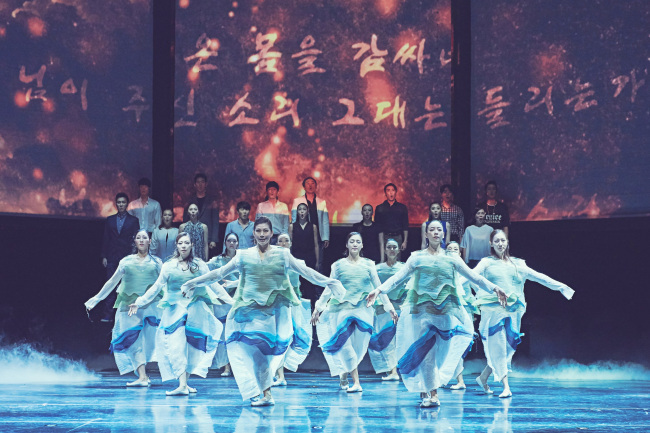 Upon returning to Seoul they combine their discoveries with traditional and contemporary Korean music and dance, creating a unique globally inspired performance in celebration of SPAC’s anniversary. This production will star Keum Seung-hoon, Park Young-su, Kim Doh-bin and Cho Poong-rae. “Nori” will be staged daily (except on Mondays) at the Arko Arts Theater’s Grand Theater in Daehangno, Seoul, until Aug. 21. Ticket prices range from 30,000 won ($27) to 70,000 won and can be purchased online at www.spac.or.kr. For more information, call (02) 523-0986.